Angela Davis is installing LIGHT CHOREOGRAPHIES at LEVEL from July 10 – 14. During this period people of all ages and with varied disabilities will experience and engage with this work that combines robotics with optics and interactivity. This forms a part of the Research & Development programme at LEVEL and is designed to provide opportunities to aid the further development of this work and explore its potential. As a part of this process David Ottley asked Angela to consider the following five questions. 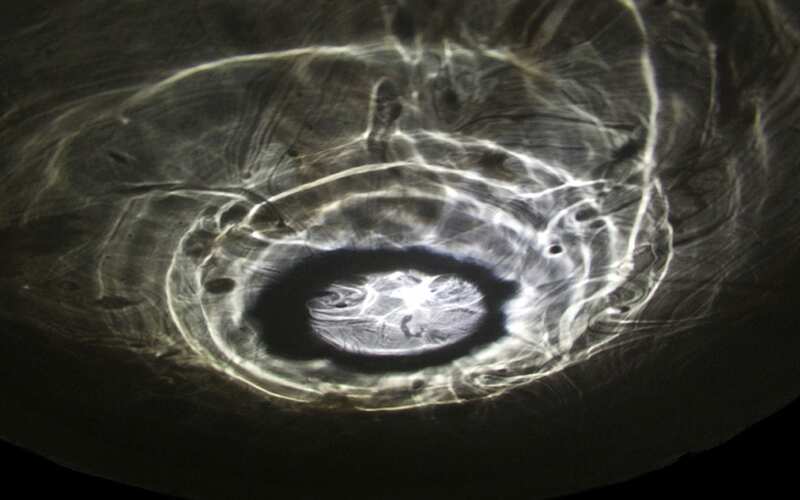 Light Choreographies is open to the public on Thursday 13 July, 6.30pm to 9.00pm. This free event provides the opportunity to meet the artist and experience first hand this intriguing new work. Can you briefly describe how you intend to develop this work with the participants at Level? Primarily, I am interested in gathering feedback on whether the light installation evokes feelings of relaxation and wellbeing. This will be achieved by gathering biofeedback from participants at the centre, before and after their experience of Light Choreographies. I am also interested in further exploring the interaction between participant and the robotic light installation. To understand if the interface is intuitive and if the participant feels a correlation between their actions and the movements of the robot. Are there any specific challenges that you are expecting to encounter? The challenge will be to ensure that the communication between the sensors and the remote sensor communicate to the robot to enable a smooth and correlated interaction. Second to this, the challenge is to successfully capture and record biofeedback from participants before and after their experience. Creatively, does collaborating with Level offer you the opportunity to develop research methodologies not usually available in mainstream gallery settings? Indeed it does. To date, I have not had the opportunity to explore how the work may impact people of different abilities. I am extremely excited about the opportunity to collaborate at LEVEL, to engage new audiences in the immersive light show and to gather biofeedback. As part of the work you will be gathering live physiological data from participants – how do you intend to do this and how do you hope that this information can be used? I intend to use a pulse sensor device for non-invasive heart rate monitoring. It is envisaged that I will be able to clip the small device onto a participant’s finger prior to experiencing the work and afterwards. I will be able to record and plot this data to explore whether there is any variability in heart rate rhythms between the two sets of data. If the data reveals lower beats per minute after their experience of the work, this may suggest that participants are more relaxed. I would like to further explore this in my practice, to potentially consider the health benefits of this type of work. Dialogues between robots and humans has long been a source of creative inspiration in literature and art. Light Choreographies offers a less travelled discussion of the potential mediative and spiritual relationship between the two. Is this a reflection of how embedded technology and automation have become in modern society or is there something else? Robotics are traditionally recognised as tools of industry. Their application can be widely seen within manufacturing and specialised procedures. While these technologies are continuing to evolve and raise provocative questions in their development, their impact can clearly be seen in our time – circuit boards made on increasingly small scales, automated industries and precision surgery. The presentation of robots at the Science Museum’s ‘500-year quest to make machines human’ was a deeply provocative show. I am intrigued in the desire to make robots appear as humans and their application as emotionally intelligent machines that can learn and develop behaviours. My interest lies in exploring the partnership of robotics with sensors. These present the opportunity to be in dialogue with the technology as responsive systems. Not to replicate a human form, but to create a visual representation of a robot. My aim is to consider the potentials of the spiritual relationship, to encourage communication with the robotic-light through actively moving and performing. The audio sound track is key in experiencing the work. Is part of your research to challenge this relationship? With an alternative sound track, or none at all could the results of the robot and human interaction suggest a more dystopian or threatening experience? The composition that accompanies Light Choreographies was specifically created for the dance performance at Theatr Mwldan. I commissioned Ant Dickinson to create a 40-minute track with 3 sequences to communicate a narrative that explored a dialogue of control and poetry between the robot and the dancer. During the live performance contact microphones were positioned on the motors to amplify the sound of the robot during the sequence where I wanted to evoke a sense of control from the robot. I felt that in the live performance, this evoked a sense of dystopia and drama. Whereas the fragile glass spheres were amplified and used as instruments to represent the moving light, to harmonise the relationship of the human and robot. On occasions where I have been exploring the interaction without the sound piece, the relationship can begin to feel quite tense. So I agree, the sound is an important element of the work. I would like to further explore this with participants at LEVEL using contact microphones to begin to build a composition to represent their experiences. When the work opens at Level how do you ask people to approach the work in the context of the space? Upon entering the space, the viewer will experience the light-navigating robot rhythmically performing, rotating and spiraling up towards the fragile glass ‘world’ to reveal a cyclical dance of light. There are no instructions of how to approach the work. In previous presentations of Light Choreographies I have encouraged an intuitive response to the piece where the viewer navigates the space to experience and understand the performance of the installation. Conversations emerge only if the participant asks questions. To prompt and to encourage interaction, I have performed with the sphere, not to demonstrate but to play and explore the choreography of light. I would either pass the sphere on to a participant or place it back on its sculpture for others to collect and respond accordingly. Feedback has suggested that the participants enjoyed a more personal experience with the piece, either on a one-to-one or small group basis, so that one can be fully immerse in the light show. I would like to encourage this dialogue at LEVEL, not to inhibit but to fully explore the possibilities to form a poetic dialogue between the participant, robotic light installation and the remote sphere.